Synopsis: Years have passed since the Vagrant journeyed to the Shining City, Vesper in arm and Gamma’s sword in hand. That is until eyes open.And The Seven awakes. Review: So here we are with The Seven, the final book in the vagrant trilogy and it feels like I've been on a journey, just as much as the characters in the book in. 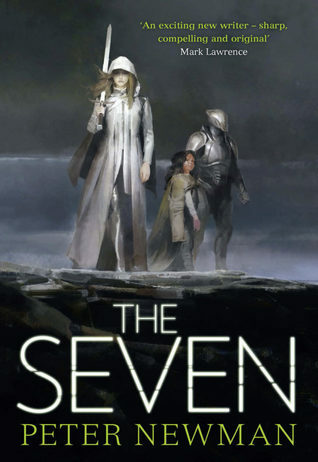 The seven is very much a call to Arms book (in the way that catching fire was...though this is not a direct comparison to that book in any way). We're left with the dramatics of the malice and now vesper bless her cotton socks wants to forge peace. This makes the book very real, bringing issues that we are all currently looking at. Issues of acceptance and how we see and treat people.. Though yes in this case some of them have been tainted by evil forces. But don't judge a book by its cover eh. One of the great strengths of this book and indeed the series is how Newman creates visuals without really saying much. Yes there is description but he doesn't go into so much detail that allows the mind to form its own ideas and I like this in a story. The eyes in the swords stuff freak me out a little, but they, like the singing swords, are these small touches that make this stand out and build its world history. And here we have the title plug... The Seven have been these almost elusive characters that have been worshipped by the people that pop their heads out in times of need or in this case when they Cling to a cause and go hell fore forward to get rid of it. I loved the interwoven story of their creation, it brought moments of softness into the story from the harshness of the more war like narrative of that chase that was going on. This book is not going down without a fight (we'll a few) and I was wolfing them up. Phrases like "and everything between them explodes" and I'm on the with this gormless face being like Wtf... And needing to read on. This book and indeed the series is a lot of things, light and dark, funny sad but overall entertaining and I would definitely recommend you give it a read! The Seven is out tomorrow...don't forget to grab your copy and let us know what you think! Whilst your're at it check out the other stops on the blog tour banner below. 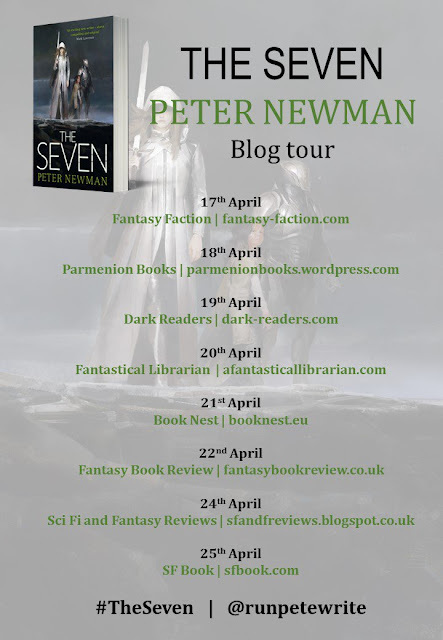 And as an extra bonus, if you're in London tomorrow evening 20th April, which also happens to be pub day Peter will be in conversation with the fantastic Juliet Mushens in Waterstones Piccadilly at 7pm so come along to that and mention you saw it here!